Travelling to wine country is always rewarding from a gastronomical perspective. What is good wine without good company to share it with and good food to accompany it? The world knows this and consequently every good wine region that we have travelled to has more than its fair share of good restaurants. 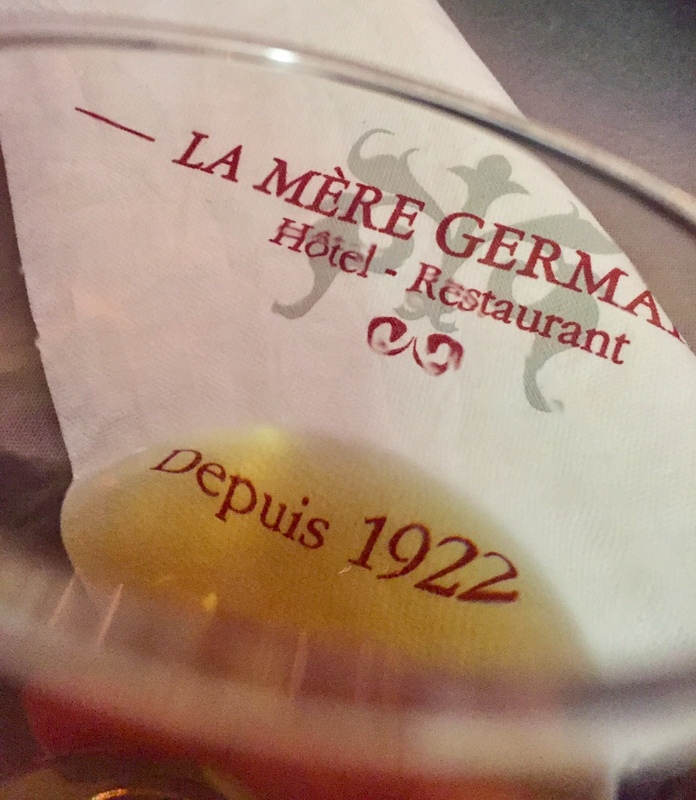 We recently discovered La Mère Germaine on our visit to France’s southern Rhone Valley and enjoyed two spectacular meals at this very special restaurant. Châteauneuf-du-Pape is the top of the quality pyramid in terms of wine regions within the Southern Rhone. Well regarded around the world, Châteauneuf-du-Pape is known for producing generous, full bodied red wines made predominantly from Grenache and usually blended with smaller portions of Mourvedre and Syrah. Its best reds can stand next to the greatest wines, not just from France, but from across the world. The region also produces miniscule amounts of white wine, and though not well known, they can be just as delicious. As a wine region, Châteauneuf-du-Pape is widely known, but at its centre is a less well-known, tiny medieval town of just 2,000 people which also has the name Châteauneuf-du-Pape. 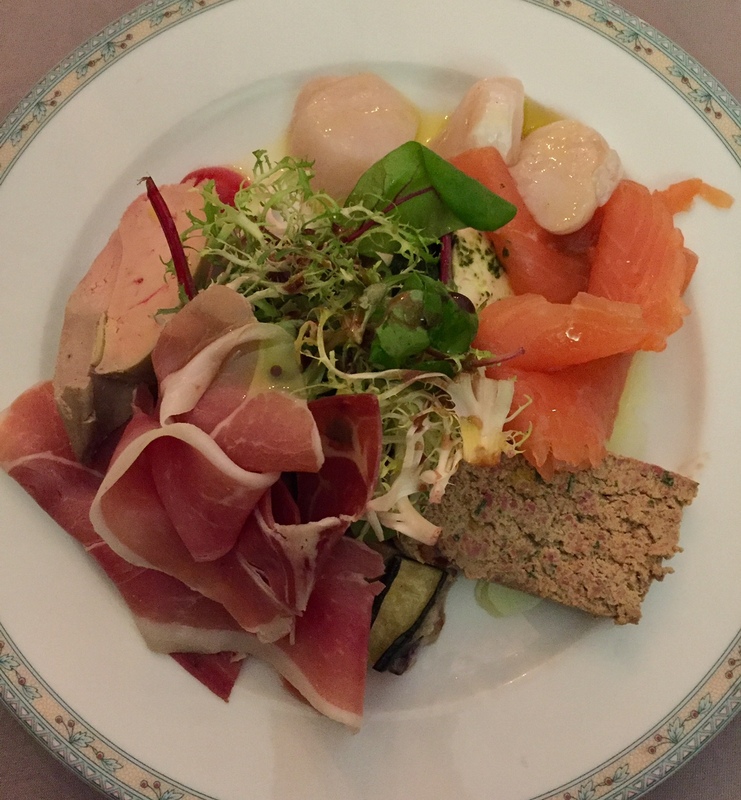 We stayed there recently and on that trip we had the pleasure to discover the restaurant La Mère Germaine. 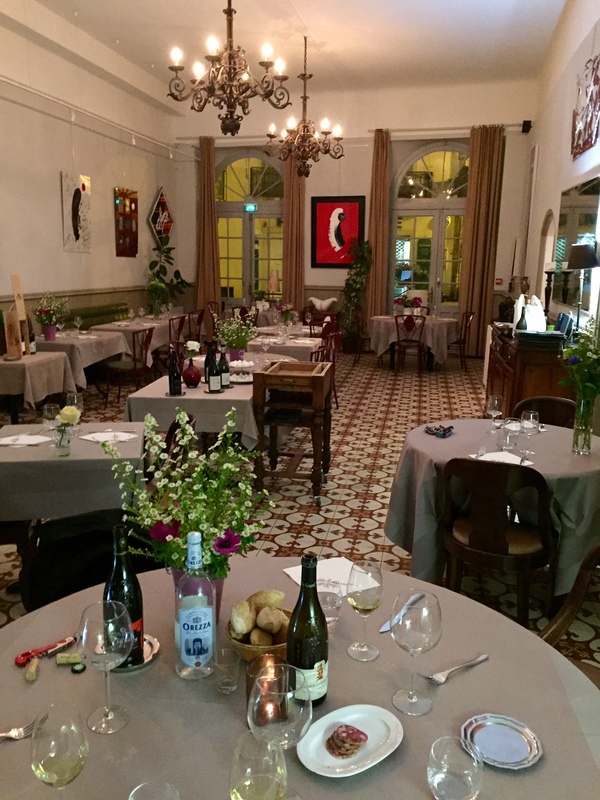 La Mère Germaine is a beautiful restaurant located adjacent to the small square in the centre of the town. The restaurant occupies the ground floor of an eight room boutique hotel by the same name. Its front faces the square and offers a view of the gorgeous 15th century buildings that have been meticulously preserved and the hustle of the town’s people and the tourists as they walk past the fountain from bakery to café to wine shop. The back of the restaurant looks out on to the local vineyards and has a terrace for al fresco dining in the spring and summer months. Inside the room is beautiful. Tall ceilings are flanked by pale coloured walls with wainscoting at their base. The walls are adorned with local art. Tables are clothed in white linen and the feel is one of casual elegance, not too formal and not too casual. The wine list is deep and well curated. Obviously there is a preponderance of Châteauneuf-du-Papes, which of course was where our interest lay. All the great producers are represented and back vintages (lots of 2010s and even a few 2007s) are interspersed with the 2012 and 2013s. At lunch on our first visit, our table of six all ordered fish and every one of us thought their meals were excellent. The presentation was just as you would want: tasteful, with an artistic touch but not over the top. And the flavours were all magnificent. Locally sourced, seasonal ingredients and an expert touch in the kitchen make for very intense flavours, delicate textures and an exquisite dining experience. This style of traditional French cooking will always be in style. 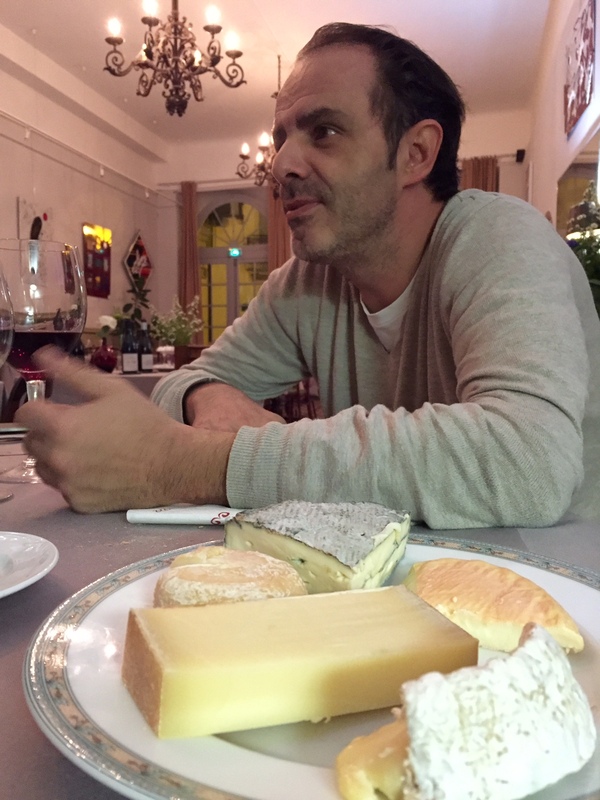 Our server was attendant and helpful, very patient with our lack of French language skills and helped us with the food menu and had lots of help to offer with the wine list. The comfort of the room, the quality of the service and utterly delicious food made our two hour lunch seem to just fly by. At the end of our meal, owner/chef David Rocamora came past the table to chat and treat us to a local fortified wine for our dessert. Charming and incredibly helpful, he set us up with tastings at two of the best wineries in the region for the following day. Sitting with him at dinner a few nights later we realized that the incredible food he is able to prepare is no accident. Trained at the Hotel School in Avignon he was class valedictorian. He has worked at some of the top restaurants in the region: Hiely Avignon, Hotel d’Europe, Avignon; La Femme, Avignon; and Beaurivage Palace, Lausanne. 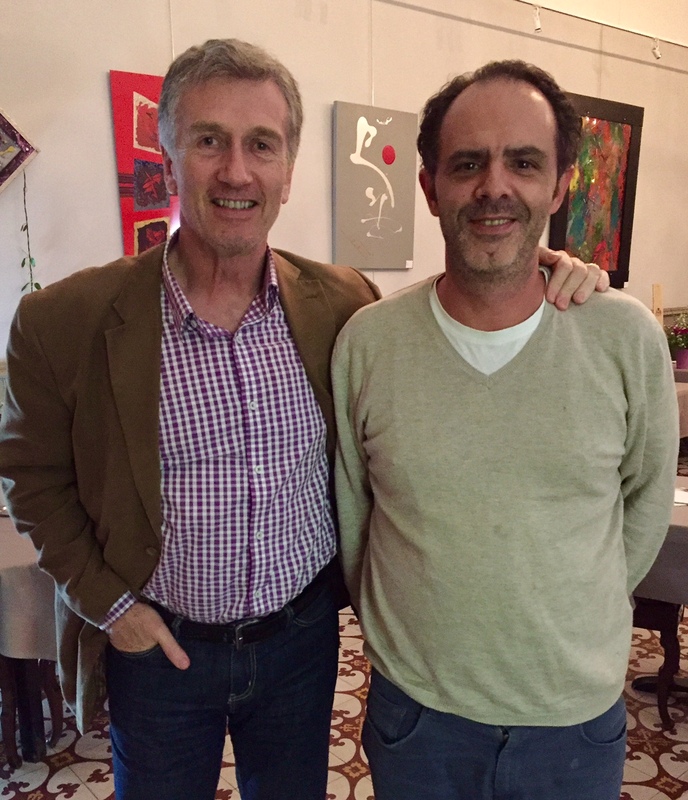 David is also incredibly knowledgeable about the wines of the region, knows most of the vignerons and understands well how the different wines interact with his different dishes. Châteauneuf-du-Pape is just 20 minutes drive north of Avignon, and about an hour north of Marseilles. La Mere Germaine is a must stop dining experience if ever you are in the region.